If there were a James Bond award for kitchen gadgetry, Boulder homeowner Judy Goldman’s kitchen would qualify, thanks to its mix of design that combines precision tools with wow-the-guests gadgets. Her Sub-Zero Pro 48 features a glass window revealing the contents. In a “Q”-like move, the Dutch Made upper cabinets open with just a touch to reveal perfectly lined-up spices—exclusively from Morton & Bassett. Goldman selected her Thermador 48 oven not only because, as she attests, it can’t be beat for cooking at altitude, but also because it’s calibrated to keep a simmer at 100 degrees. Should she wish, she can treat guests to a perfect béarnaise, but she mostly uses it to make endless supplies of stock, “16 to 20 gallons at a time,” she says. “I’m a believer that when you think about design in the home it should be an extension of a homeowner’s personality and should be welcoming based on whatever the homeowner deems that to be,” Goldman says. 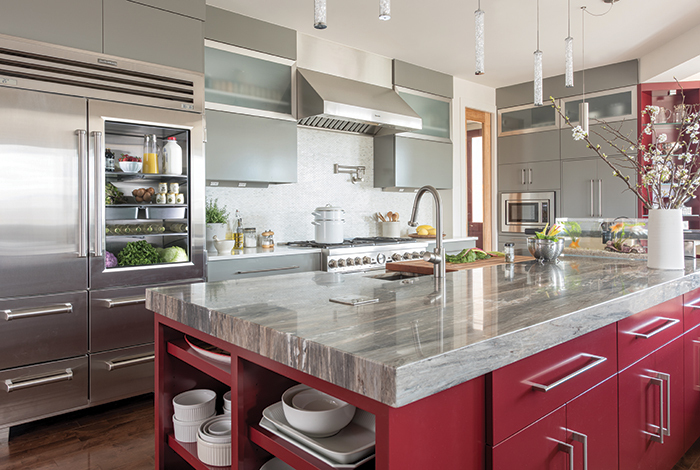 For her kitchen, she wanted colors that weren’t trending but reflected her personality and art throughout the home, deciding to contrast the island in Benjamin Moore’s Classic Burgundy against wall cabinets in Chelsea Gray. Goldman was also very strategic about where to stash items that aren’t in use. 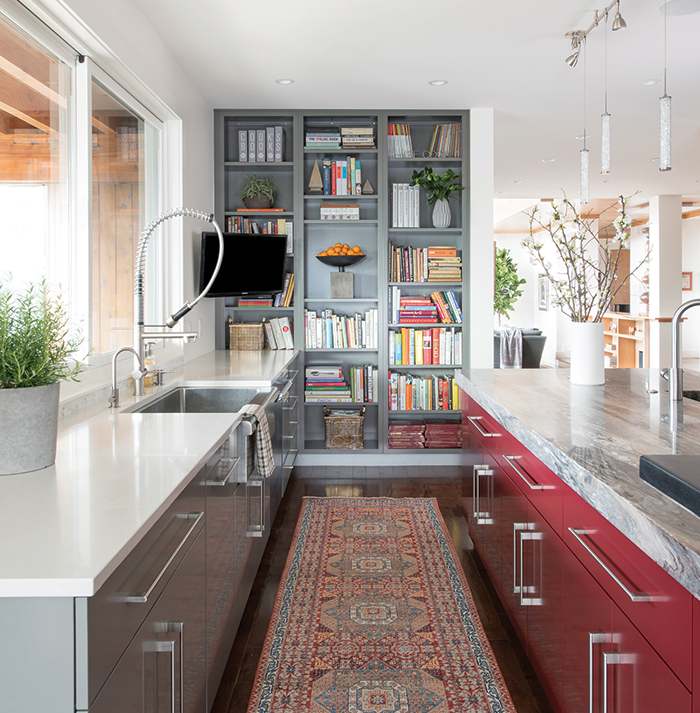 “I took a full inventory of the kitchen and thought about how to transfer it into the space. It took weeks and weeks just getting the idea of not only how to lay everything out, but what I needed in order to store what I had to make it user-friendly,” says Goldman. The goal was to be sure that everything had a place inside cupboards, too, and things like lids weren’t stacked onto pots. The designer also knew she didn’t want unsightly outlets to ruin the effect of her backsplash of Roman brick Calacatta Gold, so she placed the strips underneath the cabinets. Lighting would be critical too. “It’s dangerous to have low lighting while using sharp knives,” says Goldman. 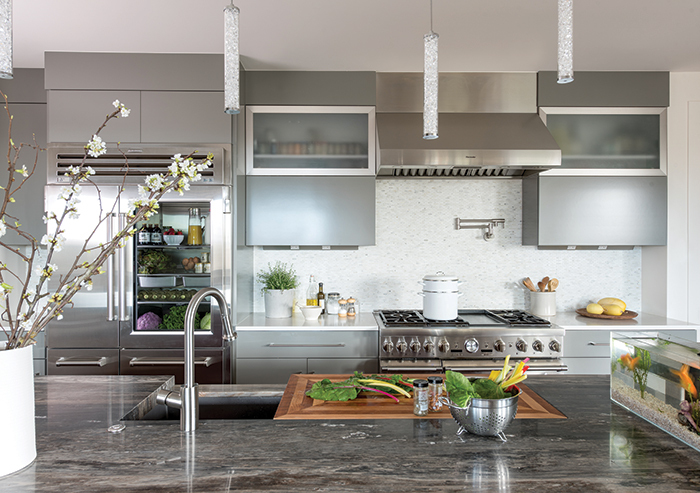 She chose EZ Jazz Venti Crystal Pendants to hang above the island and keep the space bright. 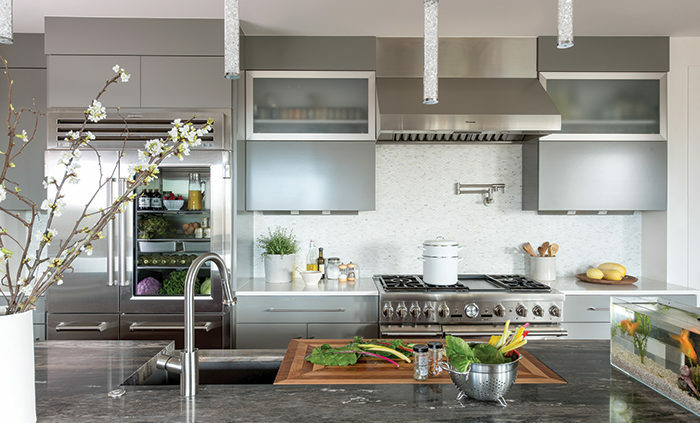 Goldman and her husband, Charlie, hired Leonard Thomas of UrbanWest Studio to reconfigure the kitchen so that the prep areas enjoy maximal views of the Flatirons, which upper cabinets had previously blocked. He also created a bookshelf to showcase Goldman’s cookbook collection that numbers into the hundreds. Goldman has been collecting since she was a teenager, when her aunt gifted her with the 1964 edition of Thoughts for Festive Foods. “It showed the days when we served colorful Jell-O molds, fringes on the legs of chicken and odd-colored food on ugly platters. I thought it was hilarious,” Goldman says. The rug is from Lolo Rugs and Gifts in Denver. Goldman chose traditional colors that matched both her art and her personality. To wit: Benjamin Moore’s Classic Burgundy on the island cabinetry and Chelsea Gray for the wall cabinets by Dutch Made Custom Cabinetry. Unwilling to cut into her Decorative Materials backsplash, Goldman made sure all her outlets were located underneath cabinets and out of sight. The Palissandro Nuvolato marble island countertop is from Moros Fabrication. Goldman’s Sub-Zero Pro 48 refrigerator is a showstopper that allows for an immediate inventory. Her Thermador 48 range is calibrated to keep a simmer at 100 degrees. 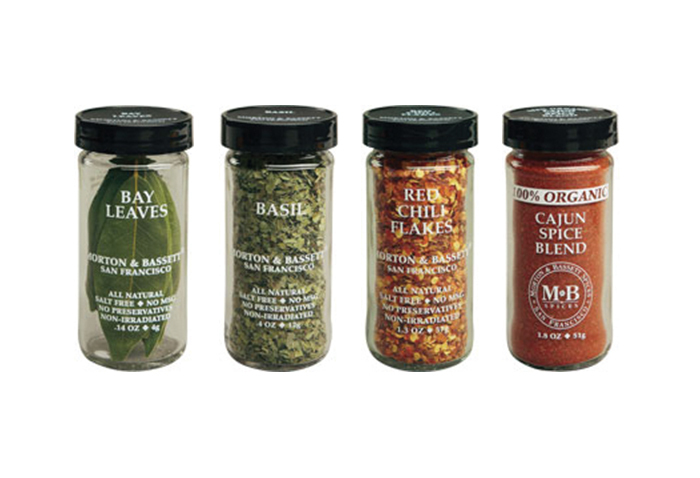 SPICES: Morton & Bassett are the only ones Goldman will use, because they are the freshest, she says. COOKWARE: “I’ve been collecting All-Clad since 1984, because they are exceptional at heat distribution, with their five-ply bottoms.” Goldman owns 23 pieces, from sauté pans to butter warmers. STOCKPOT: She relies on her stockpot with a spigot on the bottom for its ergonomics. “I can make 16 or 20 gallons at a time, and it drains clear broth from the bottom,” she explains. That keeps her from having to turn a heavy pot upside down after reducing the vegetables. SKILLET: Goldman says she will never grill steaks; she cooks them in her Lodge 12-inch Cast IronSkillet.